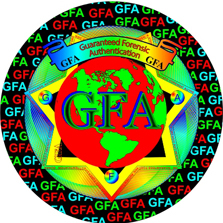 The Guarantee of Authenticity is fundamental to GFA’s concept of forensic authentication. 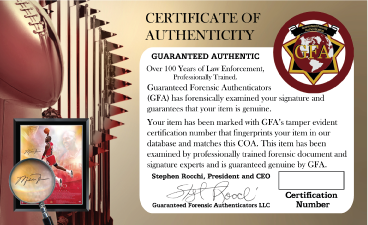 This guarantee ensures the accuracy of the authentication assigned to any GFA signature as long as it is identified with its tamper evident hologram, COA and can be verified in the GFA data base. If a signature is believed to be improperly authenticated, and a discrepancy is found when resubmitting through GFA’s Guarantee Resubmission service, the guarantee entitles the signature’s owner to options designed for their protection. If authenticity is determined under such “Guarantee Resubmission” procedures to be found non-authentic, GFA shall pay the purchase price for the autograph in question or at the owner of the signature’s option to replace the signature with a GFA authenticated signature of the original signer of similar item and value. GFA will also refund the reauthentication fee and postage and insurance costs incurred by the signature owner in sending the signature to GFA. It is understood that GFA will replace the signature or refund the purchase price after reexamination and a verifiable receipt of price paid is supplied to GFA. This guarantee shall not apply to any signature as to which an obvious clerical error has been made. This guarantee shall also not apply to any signature where the tamper evident hologram has been removed from the GFA authenticated item and/ or the corresponding Certificate of Authenticity does not accompany the submitted item. This guarantee does not apply to any item that shows evidence of tampering. Further, this guarantee shall not apply to any signature which has been environmentally damaged due to improper storage or natural disasters such as fire and flood. In addition to authenticity of the signature, the GFA Guarantee also covers the document or item signed.